This Christmas has been fantastic! So many of our Christmas traditions had fallen by the wayside with my sister staying in Nottingham and friends moving away, but it actually meant that this Christmas has been incredibly laid back and relaxing. And after all, isn’t that what the holidays are meant to be about? One thing that hasn’t changed is our Christmas eating habits. As always, Dad still managed to buy way too much food so there were plenty of veggies for our Bubble and Squeak Christmas Brunch this morning. Despite making a mountain of both traditional mince pies and marzipan topped mince pies, we have jars and jars of home made mincemeat that need using up. I love coming up with recipes for leftovers but this is actually tried and tested and has been cooked in our house over the festive period for the last few years. 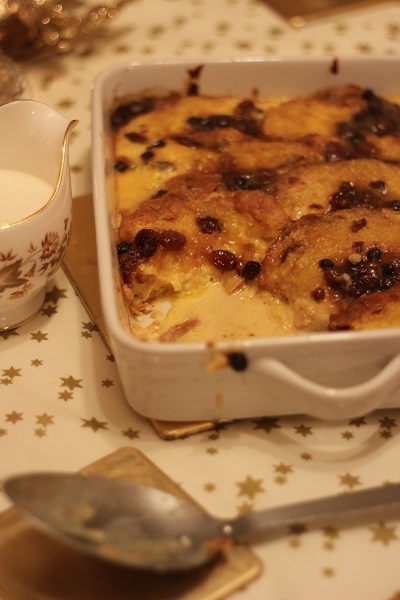 Imagine the most rich and luxurious bread and butter pudding recipe – and then add all your favourite festive flavours including mincemeat, cinnamon and cognac. 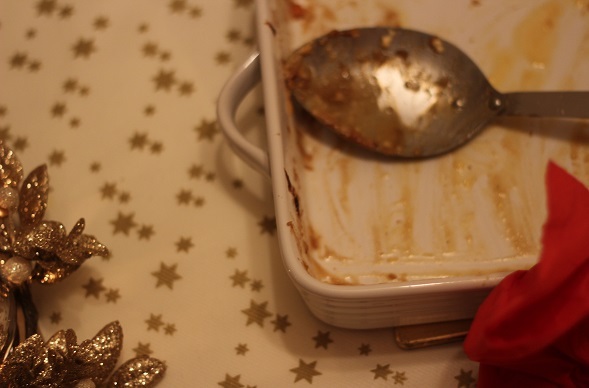 This recipe also uses leftover panattone – a staple in so many households at Christmas! You can actually make this recipe with any bread. Brioche works particularly well but any old bread will do. Don't throw away your leftover mincemeat or pannettone once Christmas is over. 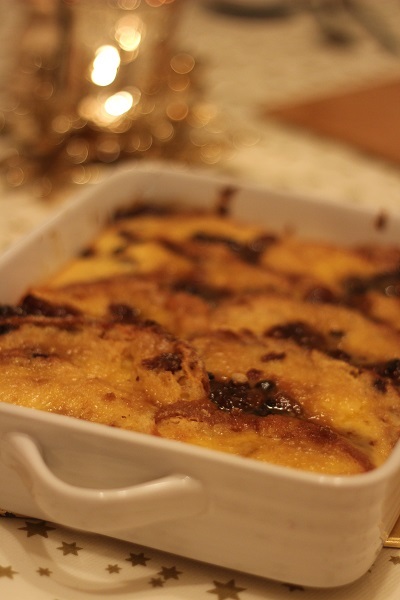 Turn it into this decadent bread and butter pudding! Preheat your oven to gas mark 3 (or 160C for electric ovens). Cut the panettone into roughly 10 slices (crusts and all) and butter them on each side. Arrange them in a large oven dish spooning mincemeat in between each layer. In a separate bowl whisk together the eggs, cream, milk, vanilla and cognac. Pour evenly over the panettone slices. Just before putting into the oven, sprinkle with light brown sugar. Put the dish into the centre of your oven and bake for 30-35mins until the pudding is set but still with a little bit of a wobble and the top is crisp and golden. A simple bread and butter recipe like this takes just 45 minutes from prep to the table though if you want to make it ahead of time, assemble the pudding, pour over the custard mix and leave in a cool place covered with cling film. The key however to the perfect bread and butter pudding is making sure you don’t overcook it. A good bread and butter pudding still has a bit of a wobble when it comes out of the oven and its good to let it sit for 5 – 10 minutes. This gives the flavours a chance to settle and mellow. Too hot and you’ll burn your mouth, then you won’t be able to taste anything! Not ideal at Christmas. Do you have any recipes for Christmas leftovers that you cook every year? I love how a good recipe can turn leftovers into a meal or dish that the whole family loves and expects to see on their table every year! Please do leave links to your favourite leftover recipes in the comments so I can check them out! Looks amazing!! Wish I had this for breakfast now! Your photos are divine! We make lobster risotto for Christmas Eve dinner and then the next day, make fried rice balls from the leftover!! Delicious! Yes it was yummy! We didn’t add anything in the middle though:) I ‘m seriously hungry !!! Have a great day of festivities!